All of the Kia Venga's engines will be available with stop-start technology. Kia Motors Corp. is aiming its new Venga at European customers who want the interior space of a small minivan but the design and handling of a subcompact. Due for its world debut at the Frankfurt auto show next month, the Venga is based on the No. 3 concept shown at the Geneva show in March. Designed and engineered by Kia in Germany, the 4068mm long Venga features a 2615mm wheelbase and offers a 1600mm high roofline to maximize cabin space. When compared with the Volkswagen Polo subcompact, which went on sale in Europe in June, the new Venga is 98mm (about 3.9 inches) longer, its wheelbase is 145mm longer and is 147mm taller. 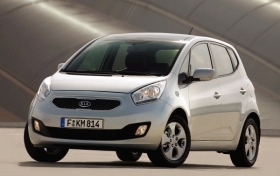 The Venga will be produced at Kia sister brand Hyundais factory in Nosovice, Czech Republic. In return, Kia will build the Hyundai Tuscon medium SUV replacement at its factory in Zilina, Slovakia, alongside the Kia Sportage. The Venga uses the same platform as the Kia Soul and shares a lot of components with the Hyundai i20 subcompact. The Venga also will share its underpinnings with the next-generation Kia Rio. The Venga will offer 1.4- and 1.6-liter gasoline and diesel engines. All four of the powerplants will be available with Kia's fuel-saving stop-start system. Kia Motors will begin offering a stop-start system in Europe this spring. German partsmaker Robert Bosch GmbH supplies the stop-start equipment to Kia. In city driving, the system can cut fuel consumption and emissions by up to 15 percent. Savings in mixed driving conditions average 6 percent. The Venga goes on sale in Europe in late 2009.